Aaron Rhodes lost 43 lbs. with Body Beast, Shakeology, and the 21 Day Fix meal plan. He entered his results into the Beachbody Challenge, and won the $500 Daily Prize for October 12th! I was lost. I had no self-control and no commitment to my own health. I also work in a fast food restaurant. I was always eating and always tired. I slept until I had to go to work, and most of the time, I fell asleep on the couch after I got home. I would see my pictures and just thought “eww.” I tried to avoid anyone taking pictures as well. I had no time and no energy for anything at all. I was not happy with the way that I looked in the mirror, in pictures, on video, or with how people would describe me. My gut got to the point that I used it to help hold the chicken trays at work (lol). Just sad. A few days before I ordered the program, a guy called my work and was complaining about an issue he had. He said that the big, heavyset manager was in the back at the time. This was the first time I ever heard the words heavyset to describe me. This may sound weird, but I looked up at the security video of myself on the phone at that moment and all I thought was “Eww, I am the guy he described.” I was not happy about that at all. Later, I was sleeping on the couch and woke up to a Body Beast infomercial. I used to love weight lifting and thought that I could do that program. I have never purchased a TV-advertised workout program before, but felt challenged by the Beast. So I took the challenge and bought the program despite my wife’s doubts that I would ever use it. My greatest challenge was making time for anything outside of my current schedule of work and sleep. I started the program the same day as I started a 21-day challenge with my Coach, Tiffany Miller. The two together helped me stay on track for my first 21 days, and after that I was addicted to the workouts and Shakeology. I now get up at 6 AM, hit my home gym, and work out. I have gained almost four to five extra hours a day that I am awake and able to function. I have learned to control my portions, appetite, and eat healthy thanks to the 21 Day Fix meal plan I received with my Challenge Pack. 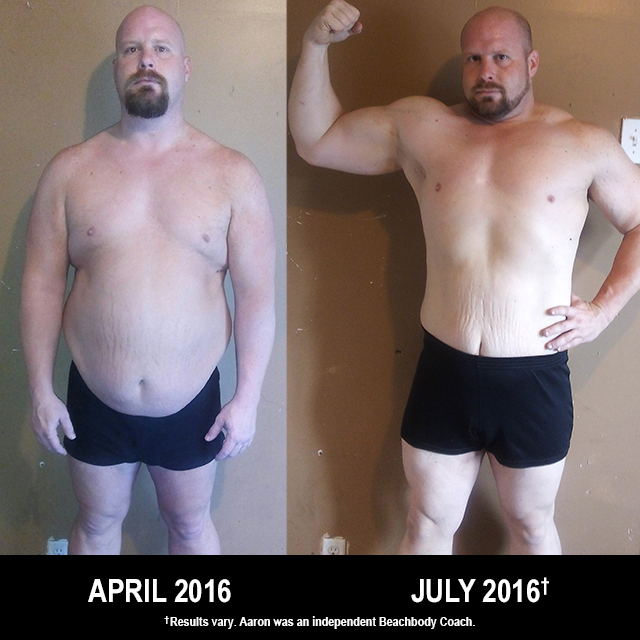 Thanks to the combo of Body Beast, the 21 Day Fix meal plan, and Shakeology, I have totally transformed my body, mind, and day. The only problem I have now is that I have had to find a new way to hold the chicken trays, because I no longer have a gut. At first I did not have any weights at home. I was able to stream the program using Beachbody On Demand at the gym and start my workout. A couple of weeks in, I was able to hit some yard sales and get the weights I needed to work out at home. I love the fact that all I have are dumbbells yet I am able to get a gym’s worth of weightlifting at home, and have seen awesome results. I have lost a lot of inches everywhere and seen the fat melt off while seeing my muscles form and become obvious. I have built muscles all over my body while losing 43 lbs. with the program. I am positive that I lost more pounds than that, because I have put on muscle at the same time. I am proud of the energy I have achieved with this program. I am so happy about the weight loss I have seen. I am now 279 lbs. — that’s less than I was in high school! I am now the smallest and in the best shape I have been in 18 years. I have not been below 300 in seven years. Also, I am not stopping anytime soon. My journey has just begun. People are always commenting on my weight loss. This makes me feel good and boosts my confidence and morale. People I have never met keep coming up to me and saying one of two things: “Has anyone ever told you that you look like Stone Cold?” (I personally think Steve Austin looks like me, not the other way around.) Or they will say, “OMG, why are you not a wrestler?” I am getting a kick out of how tired my employees at work are getting of hearing these two statements. I am happy with the way I look and look forward to keeping the progress going. I like the attention; I mean who doesn’t, right? I still keep in contact with my Coach for help and advice. The 21-day Challenge Group was a perfect start to get me started on my program and the road to success. This gave me the kick-start I needed to get up to speed and head toward the right direction. Having that daily accountability made me want to have results to share with the group. Tiffany Miller was awesome from Day One when she wrote to me about the new program and invited me to join the first Challenge Group. Along the way, Tiffany would write me to see how I was doing and how my progress was going. She helped me understand and set my goals and nutrition needs. She continued to comment on my progress and keep up-to-date with me even after the Challenge Group had ended. She was such an encouragement and inspiration to me that she was the first one I sent my progress photos to when I completed the program. I think I have found a Coach and a friend. Shakeology has been key in helping to control my hunger, boost my energy, and help me feel healthier every day. On days I skip Shakeology, I can tell the difference in all of the above. I have found my favorite recipes and look forward to my shakes every day.